The “normal” cell cycle is characterized by the series of events that take place in a cell leading to its division. Resting cells that are not dividing are in a phase called G0. During division, the cell undergoes 4 distinct stages termed G1, S, G2, and M. In G1, the cell grows in size and prepares for DNA synthesis. During the S phase, the DNA replication takes place. In G2, the cell continues to grow and prepare for division that occurs in the M (mitosis) phase which is the process by which the cell separates the chromosomes in its cell nucleus into two identical sets, followed by cytokinesis, which divides the nuclei, cytoplasm, organelles and cell membrane into two daughter cells. 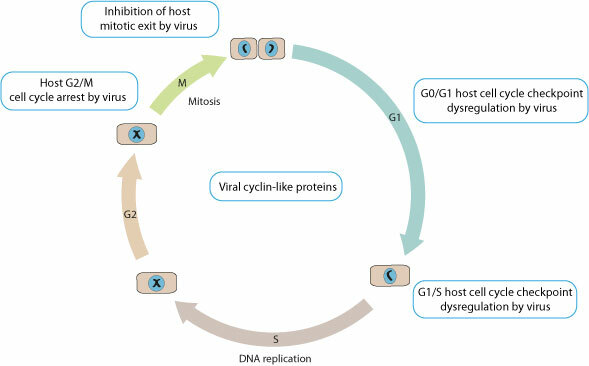 Many viruses subvert the cell cycle to their advantage. They usually target specific steps of the cycle to improve viral replication. For instance, some viruses are able to induce a G1 to S phase transition in order to replicate their genome at the same time of cellular DNA synthesis. Other viruses can induce a G2/M arrest in some cases to provide an optimized cellular environment for maximal levels of viral replication.